Intaka is a constructed wetland next to Canal Walk in Cape Town, with hides and walkways that allow close access to birds. There has been much breeding activity for the last few weeks, and the breeding season will continue for the next few months. Intaka photographers often photograph weavers with metal rings, as many have been ringed, and post these to the Intaka facebook group. Yesterday morning 54 birds were caught at Intaka, mostly weavers and warblers. 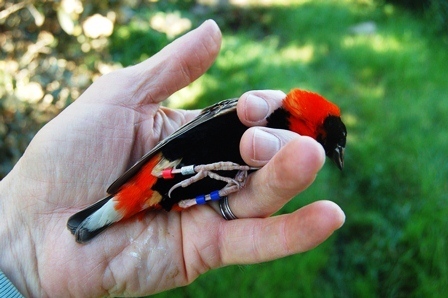 18 of the weavers (adult birds only, Cape & Southern Masked Weaver, Southern Red Bishop) were given colour rings. Now, in addition to taking stunning photos, photographers can contribute to SAFRINGs database by putting photos of birds (where the colour rings are clearly visible) on facebook! 1st prize - photo of CRW at its nest, and you upload the record to the ADU Virtual Museum. Of course, any PHOWN (PHOtos of Weaver Nests) records are welcome even if the adults are not ringed!